San Francisco: The Pacifica is a great looking vehicle. Dont just take my word for it. Its at a dealer near you. Steve Sowinski, the Senior Designer of the Pacifica, calls it the "Handsome Protector." Nice name but it sounds somewhat masculine and Pacifica is a lady, at least it was at the Golden Gate International Exposition of 1939-40. Pacifica was an 80-foot statue by sculptor Ralph Stackpole, created as the theme lady for the Exposition. 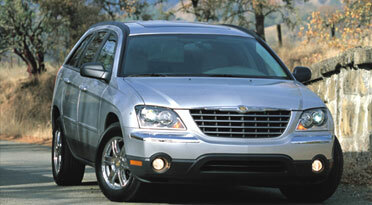 I told Steve that when looking at a Pacifica in the rear view mirror I saw the updated face of a 56 Chrysler. He said it was not intentional and asked if it was a good thing. Yes Steve, its good. Take a look at that 56  its strong and friendly looking. So is the Pacifica. One thing I noticed is that the Pacifica looks better in person than in photos. Pacifica is not a small car but it looks smaller in real life. The design helps by drawing it out with horizontal lines and by "squishing" it with the blackout lower rocker area (below the doors). Overall, I am impressed with the design  from every angle, it looks good, but I especially like the front. What is the Pacifica? Is it a mini-van? A SUV? Or horror of horrors, a station wagon? Chrysler calls it a "sports tourer." What is a sports tourer? I do not know. Its one of those vague phrases that mean something different to each of us. The Pacifica is a six-passenger, luxury, sporty, car. Thats right, Im calling it a car. It has ride and handling on par with many sports sedans. It has the comfort and amenities of many luxury cars. It has the utility of, well a station wagon. Chrysler allegedly has banned that name but I like station wagons. Both the rear and middle seats fold to give an almost flat load floor. There is a slight slope up towards the front seats, but the floor is flat. Chrysler sees its competition as cars like the Acura MDX, and Honda Pilot. Id add the new Nissan Murano and Infiniti FX. How does the Pacifica compare? In the long run, who knows? In the here and now, Id say pretty well. I drove the Pacifica over a wide variety of roads. I was extremely impressed with its ride and handling. Weighing in at about 4,675 lbs, the Pacifica is no lightweight yet it handled the very twisty two-lanes going up into the hills nicely. The 3.5-liter, 24-valve, SOHC, 250 hp V6 does okay but it is not as smooth as some of the competition. Some of the other auto writers felt it needed more power. Sure, Id always take more power but when I look at the type of people who will own the Pacifica, more power probably will not be on their list of must haves. The base Pacifica is front-wheel-drive (FWD) with all-wheel-drive (AWD) an option. Chrysler expects the majority to be AWD. Im not sold that AWD is necessary but the downside is so small (extra weight, reduced performance) why not go for it. Any safety advantage, no matter how small, is welcome. Two other safety advantages are also neat. First is the optional navigational system. How can this be a safety item? Easy, for the first time the screen is placed within the drivers normal line of sight, right in the instrument cluster. It is neat. The other safety advantage is the optional "Uconnect" communication system. This was really trick and comes at a time when many jurisdictions are looking at making cell phone use in vehicles illegal. UConnect makes specific cell phones automatically hands-free as soon as you enter the Pacifica using BluetoothTM technology. It is truly a hands-free system with incredible voice recognition. Push a button and say the phone number, it dials it. Sometimes technology does make things better. With the Pacifica, Chrysler has taken a page from some of the imports, more standard features, fewer options. You can choose between FWD and AWD, add heated front and second row seats (may not mean much to you but you know, when its 10 degrees below 0 your passengers will thank you), leather versus cloth seats, the navigational system, an incredible optional sound system (the base system will blow you away, the optional system will take you to another galaxy), Uconnect hands-free Communication System, a DVD rear seat entertainment system, SIRIUS Satellite RadioTM, and high-intensity discharge headlamps (these should be standard in my opinion).